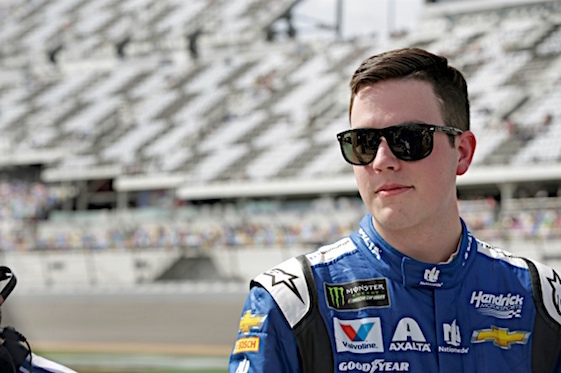 So much for Alex Bowman suffering from the pressure of taking over ride of NASCAR superstar Dale Earnhardt Jr. Bowman drove the No. 88 Hendrick Motorsports Chevrolet to the pole of the 2018 Daytona 500 on Sunday. Bowman laid down a lap of 2.5-mile Daytona International Speedway at a speed of 195.644 mph. The pole was the second of Bowman’s career and comes a year after Earnhardt won the pole for the 500 in his final season before retirement. Denny Hamlin will line up alongside Bowman after recording a speed of 195.092 mph in his No. 11 Joe Gibbs Racing Toyota to nab the second starting spot for the “Great American Race.” Hamlin is the 2016 Daytona 500 winner, but has never started on the front row for the sport’s biggest race. Bowman and Hamlin also were fastest in the opening round of qualifying. Sunday’s two-round, single-car qualifying session only produced the front row for the season-opening Daytona 500 on Feb. 18 (2:30 p.m. ET, FOX, MRN, SiriusXM NASCAR Radio). The rest of the field will be determined by Thursday’s Can-Am Duels (7 p.m., FS1, MRN, SiriusXM NASCAR Radio). The lineup for the Duels will be set based on Sunday’s qualifying speeds. Jimmie Johnson, Kyle Busch and William Byron all showed speed during qualifying, posting the third, fourth and fifth-fastest speeds (respectively) in Sunday’s session. But their Daytona 500 grid positions, along with the rest of the field aside from the front row, will be set based on the Duels.